The Tour of Georgia ended today and it was a great success for the USA National Development team sponsored by VMG (Velocity Made Good). The team had seven of the eight riders finish a very tough week of racing. I was on hand to help collect the SRM data and work with the riders and directors on how to best make use of the data collected. Going into year two of using Training Peaks and SRM the national team will have some great data to compare to. Great race guys and good luck the rest of the season. approach Sunday’s Paris-Roubaix (April 15) brimming with confidence. and he is ready," says Hoffman. 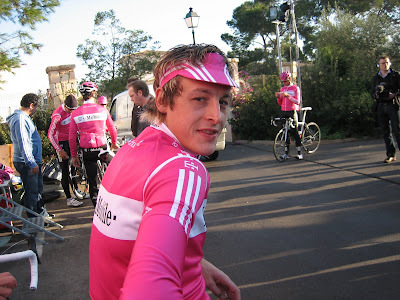 to use his top-end speed in a small group sprint for the podium. off a surprise on Sunday." are Bert Grabsch, Lorenzo Bernucci and sprinter Eric Baumann. A question mark hangs over Servais Knaven’s fitness to start on Sunday. US rider Aaron Olson will slot in as the team’s eighth man on Sunday. Grabsch (31), Andreas Klier (31), Servais Knaven (36/Netherlands). T-Mobile First and Second in Gent-Wevelgem! You heard it right. T-Mobile came through in a big way today to take first and second place in the Belgium classic Gent-Wevelgem. The team tactics and fitness lined up perfectly today for Marcus Burghardt and Roger Hammond. Great job guys! Marcus Burghardt relaxing before a long day of training in Mallorca. Each training session was planned out per individual by team doctors, and in addition all 30 riders had their SRM data analyzed each night prior to the next day's training. The hard work and systems are starting to pay off. Here is Roger Hammond working with Gear Fisher to learn the Training Peaks system at the first team camp in Lugano. Each rider was trained on how to use WKO+ to download and analyze their SRM data, then synchronize the files up to their online Training Peaks accounts. 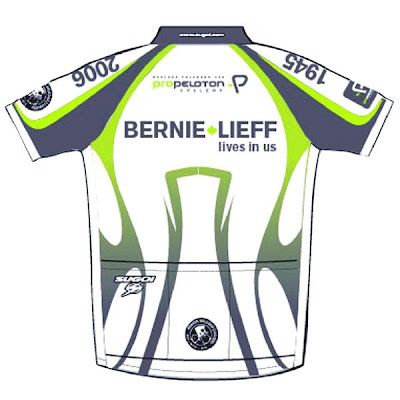 Due to last week's snowstorm in Boulder the Boulder-Roubaix Classic and the 2nd Annual Bernie Lieff Memorial have been rescheduled to this weekend. Let's just hope that Friday's snowstorm doesn't disrupt the schedule once again. Bernie passed away February 2006 after battling melanoma. He was well known by many Colorado cyclists as being a grown up kid on a bike. He either rode his bike or played hockey everyday and lived life to it's fullest. Come Join Us Sunday April 15th for the annual ride. Riders of all abilities are welcome. The ride will begin at Pro Peloton at 10:00am. All proceeds will go to Melanoma Brain Tumor research. This is a big weekend for racing with the Tour of Flanders, US Open and closer to home the Boulder-Roubaix. Tom Danielson is scheduled to race Boulder-Roubaix just one week away from the start of the Tour of Georgia. However as I type this a cold rai has begun in Boulder and SNOW is expected tonight and tomorrow so it will be interesting to see who shows up to brave the storm. It won't be a fun 80 miles on dirt (for more see http://www.dbcevents.com/ ). Here are team rosters for Predictor-Lotto this week and next..
For up-to-date news, modifications & results: www.predictor-lotto.be! Come Join Us Sunday April 8, 2007 for our second annual ride. Riders of all abilities are welcome. The ride will begin at Pro Peloton at 10:00am. All proceeds will go to Melanoma Brain Tumor research-the disease Bernie died of. You may order them from ProPeloton or at the Boulder Roubaix Road Race.